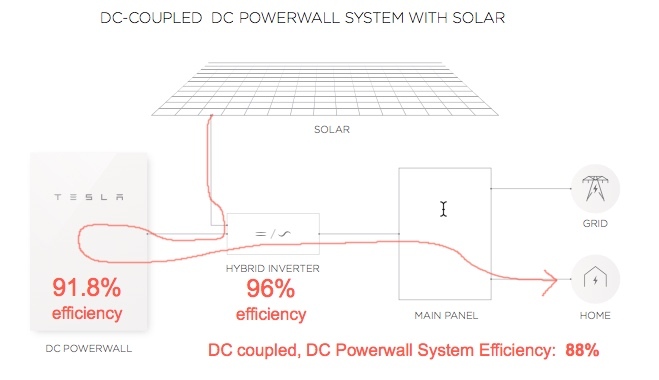 Home > Battery Storage > Powerwall 2 Full Spec Released: Low cost but ‘unlimited cycles’ warranty has limits. The specs reveal the rumours of 2 versions of the Powerwall 2 are true. An AC coupled and a DC coupled version will be released, both batteries for $8,000 + GST + installation. This is a very smart move. The AC version has an internal battery-inverter to change your home’s 240V AC to the 50V DC the battery operates on and vice-versa. This means it should be a piece of cake to retrofit to any existing grid connected solar power system. I was really hoping that Tesla would have gone Rock or Bust and included a solar inverter as well as a battery inverter (AKA a hybrid inverter), as that would have made full solar and battery installs much simpler and cheaper. But I guess it is a Long Way to the Top and I’m predicting the Tesla Powerwall 3.0 will come with an integrated hybrid inverter that you simply plug the panel array into. 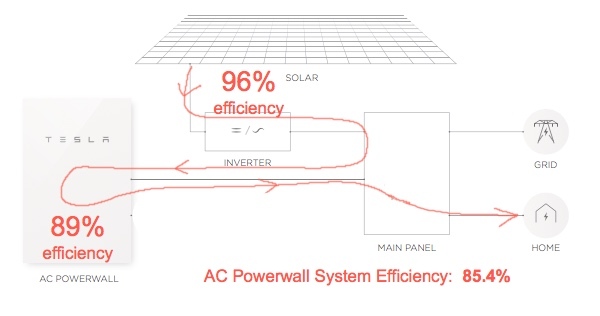 The AC Powerwall 2 battery has a roundtrip efficiency of 89%. The DC version is 91.8%. Tesla says the Powerwall 2 batteries are 100% depth of discharge. I don’t actually believe this because completely discharging lithium-ion batteries is bad for them. I think the batteries are larger than 13.2kWh and when they reach what Tesla calls a 100% discharge they’re actually not completely flat. But I do approve of Tesla describing them this way, as it keeps usable capacity and nominal capacity of the batteries the same – eliminating confusion for consumers. The AC version will have adjustable ‘Power Factor’. This means that it should comply with the latest Australian inverter standards (many older model inverters don’t meet these latest standards and so can’t be installed any more). I was not a fan of the Powerwall 1’s warranty. But I’m happy to say that the Tesla Powerwall 2 warranty is much, much better. While there are still a few clauses that should not be in there – as they are clearly overridden by Australian Consumer Law – the warranty is generally clear, short, in Plain English and, apart from one point, unambiguous. Now you’d be bloody unlucky if your Tesla Powerwall 2 failed the day after the warranty expired – so your actual cost per kWh will be less. But as a relative comparison of the cost of storage – that the manufacturers will warrant – it is a really useful number. 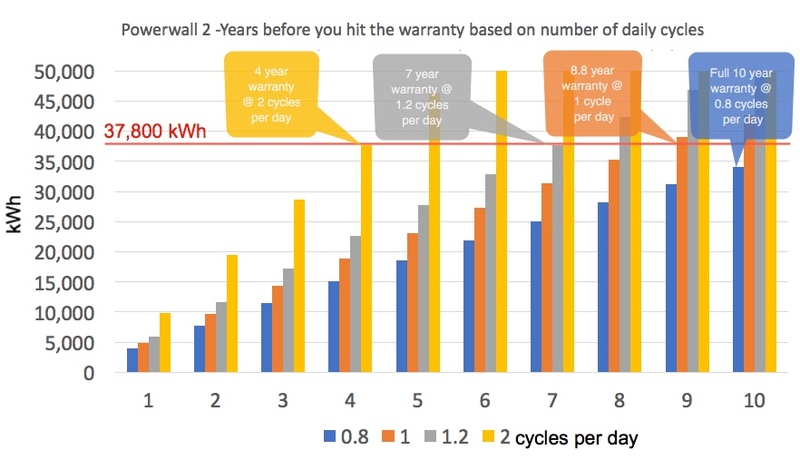 The really exciting thing about the Powerwall warranty details are that they show a cost per warranted kWh that is 25% lower than its nearest competitor, the GCL E-KwBe according to our freshly updated battery comparison table. Because many people are going to want to charge their Tesla Powerwall 2 with off peak grid electricity, or use a service like Reposit, or charge it with a generator if off-grid, most people are likely to fall into the second warranty category and have a hard limit of 37,800kWh for their warranty. So what does this hard limit mean in practice? At a retail cost of AUD$8,800 inc GST and 37,800 warranted kilowatt-hours of storage, that gives a cost per warranted kWh of 23.3 cents. This is 25% lower than the GCL EKwBe, 30% lower than the little known DCS PV5.0, and 40% lower per warranted kWh of Tesla’s main rival, the LG Chem Resu 10. If you want to assume your Tesla Powerwall 2 will provide 50% more kilowatt-hours of storage than it is warranted for before it dies, then you are looking a cost per kWh of 15.5 cents. That’s pretty compelling for large users of electricity with large solar systems. For early adopters looking to buy a large battery storage system, then the Tesla Powerwall 2 looks to be unbeatable right now. Next Article: Solar Rebate Ending? Will the powerwall 2 be a good fit for OFF GRID application? I don’t have any real information on how the Powerwall 2 will be installed for off-grid use at the moment, but I can investigate the economics of it by making a few assumptions and so get something written on it for you before too long. But I can say right now just eyeballing the information I have that it doesn’t look good for people who are currently on-grid and hoping to save money by going off-grid. But for people who have no choice than to be off-grid, it could be extremely useful. Alot of people choose to be offgrid, it is often the best choice! Outback is making Skybox (mid 2017) that is made by people who know home power systems. Schneider Electric has plans and is testing the Conext Bridge also made by people with a long history making power anywhere. Both of these options should be looked at mid 2017. I would say to look at how the system allows the Li-ion bank to be tested and troublshot, especially offgrid! Schneider already has a Lithium Iron Phosphate compatible battery that integrates seamlessly with the XW, charge controller, Conext Bridge etc. The battery is available from Discover and includes a 10 year unlimited cycle life warranty. Maybe this is the system Dave was referring to as being available mid 2017. The Conext Bridge has just about finished testing and will get approval From LG Chem any day now. The Bridge will work with any battery that has a BMS that can connect into xanbus thru the canbus in the battery system. The Discover system does use xanbus but does not communicate the Battery state of charge or state of life from the battery BMS. (Not compatible with the Bridge) I think having this data is very valuable but is a decision that needs to be thought about. For instance, I can take an LG Chem Resu to a house, connect a positive and one negative battery cable, a network cable and connect the “bridge” a small controller into the xanbus network. At that point I have all of the data available and an extremely simple installation. Xanbus is the network Schneider uses to communicate with all the devices like mppts, Inv/Chgs, gen start, combox, and control panels. For off-grid be sure to consider not only the energy capacity but also the demand and load power factor..5kW can get sucked up pretty quick on a cold night when the water heater kicks on. Try an ‘instantaneous’ gas HWS. Wastes nothing and can ~ if you can be bothered ~ run on any other kind of gas: eg woodgas etc. ps. Even easier —> a roll of black polypipe in an insulated box feeding into a well-insulated storage tank and then through an instantaneous HWS. More efficient when off grid to go gas for cooking, and any mix of solar/instant gas/wood fire for hot water and ditch the clothes drier. This will see most modern homes capable of getting along with 7-7.5KW reasonably comfortably. 5KW is definitely a bit tight for most. I had a family of 5 (3 teens) and we moved off grid. There were very few occasions when we tipped over the 7.5KW peak. Computers TVs fridge & freezer all happening just like on grid. The occasions when peak was exceeded the iron, washing machine and microwave were all operating too. Hi Finn, Excellent article, i have a few questions you maybe able to answer…. There is some sort of gateway device that Tesla have, what does that do? I’m assuming that the gateway monitors the solar generation, consumption and the battery is instructec to be discharged or charged as the case maybe. Given my array is only connected to one phase of the three phase supply, does the gateway monitor all the phases? And export on the one phase to compensate for the consumption on other two phases? I note that the Powerwall can be used as a backup in case of grid failure, i assume a relay of sorts is used to disconnect from the grid and the battery supplies the load on a single phase, will the Enphase inverters detect this and supply the load/charge battery? Or will the micro inverters stay offline? I would be interested in any comments and information on integrating a micro inverter based system with the Powerwall…..
Hello Mohan, Ronald here. Without the need for backup capability, the AC version of the Powerwall 2 can be installed regardless of what kind of inverter is used, including microinverters. This is because the AC Powerwall 2 and the inverter or inverters will have nothing to do with each and will operate independently. But how the AC Powerwall 2 is supposed to supply backup power is a big mystery and I am waiting for Tesla to release some information on this. True, but Tesla had ‘approved equipment’ restrictions. used on a new installation. Hello, I have 6.3 kW system and wanted to consider the battery storage. However, I looked into my energy consumption and realized that during the last 12 months I produced more energy only during two months period. To be able to use the battery I’ll need more energy production. My question is can I increase the size of my Solar system? I understand that the inverters are up to 5 KW can I daisy chain two inverters or do they have higher capacity inverters? Hello Ilian. The easiest way to add to your rooftop solar capacity may be to add a second system with a second inverter, provided you have enough roof space. But there are inverters larger than 5 kilowatts, so having one larger inverter is an option. But whether or not you will be permitted to expand your rooftop solar capacity will depend on where you live and whether you have single phase or three phase power. 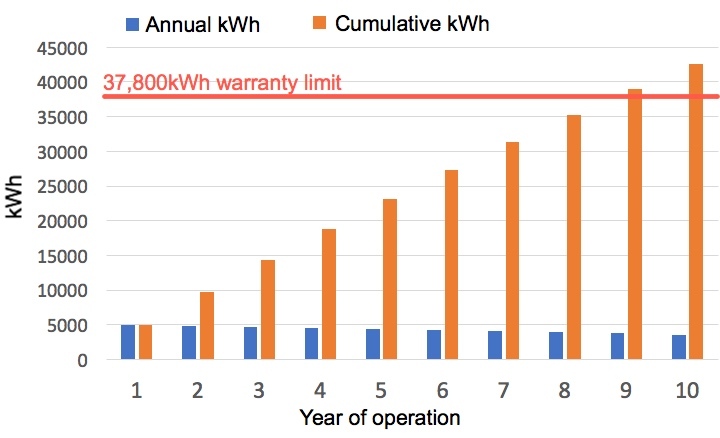 In South Australia 10 kilowatts of solar can be installed on a home with single phase power, but in many parts of Australia households are often effectively limited to a total of 5 kilowatts of inverters and 6.66 kilowatts of panels or even less. So if we compare only battery cost (without installations costs and additional hardware) no need to add +800 AUD to price. Thanks for pointing that out, Max. It seems Tesla has updated their page. So now they are suggesting the total cost including installation will be $10,150 or about $250 less than the last information we had from them. Great article. It seems like either category tesla is limiting the cycles to 3200???. may be their battery only rated to cycle up to 3200 cycles either way but by claiming unlimited for category one seems to be genius marketing plan. another helpful article , I am having 7.5 KW of Trina 250w installed on a north facing roof and am choosing between Fronius Symo 6.0-3-M 6,000 watt three-phase inverter and Fronius Symo Hybrid 5.0-3-S the hybrid would bring it down to 6.5KW. At a later stage I will be adding a tesla powerwall 2 so my question is can a powerwall 2 be added to either inverter or only the hybrid? I know in this article it reads any inverter but other articles speak only of the hybrid inverter. Hello Russ, Ronald here. According to Tesla the AC version of the Powerwall 2 can be added to any existing rooftop solar system. The DC version will no doubt require a compatible inverter, but so far there is no word on what these compatible inverters will be. A total of 5-6 kilowatts of north facing solar panels will be enough to fully charge a Powerwall 2 in most of Australia on a majority of days, but only if the household doesn’t consume a lot of solar electricity during the day. For example, if people are usually out of the house for most of the day. I have just had a solar installed (5Kwh-Sunnyboy 5000TL invented. Monitoring the control pane, and the two new digital meters fitted as part of the installation in the distribution board. But trying to make some sense of all the numbers. The two digital meters in the distribution board, I am told one will show gross domestic usage (i.e. Combination of solar and grid power consumed), and the second meter shows solar exported to the grid. On the inverter control panel it shows instantaneous power, total power generated today, and total power generated to date since the unit was commissioned. So can I calculate that the total power generated since commissioning less the metered power exported shows how much solar I have consumed. Then taking that number, can I deduct that from the gross usage metered number to show how much grid power I have used. This technology is advancing rapidly. Businesses need to continue to innovate and use technology to reduce costs or increase value or die. .
For many years I have kept a look out for developments concerning the CSIRO developed UltraBattery. In the early years the UltraBattery drove an EV for some 100,000 kilometres. The UltraBattery seems to have many, many things going for it – especially iits near total recycling. What seem to be lacking is any meaningful indication of the prospect of the UltraBattery technology being able to compete with lithium technology in terms of cost. Given the projected cost reductions from the Tesla Mega Factory and just one of the many emerging technologies, the 24M/NEC battery, it would be great to know if the UltraBattery, produced by just one of many lead acid manufacturers, will be able to compete in a $200/Kw world – acknowledging that the “real cost” is determined by many other factors. For a lay person, like myself, the UltraPod looks very attractive but do you, Ron and/or Finn, think Ecoult will be able to compete. If the technology is competitive in the long-term there seems little reason why the UltraBattery could not be produced in many existing lead acid battery factories around the world; including Australia. While Ecoult will be wanting to generate as much revenue as possible it is going to interesting to see if the UltraPod comes on the market at a price competitive with PowerWall 2? Lead-acid battery manufacturers themselves do not appear to be attempting to compete with lithium-ion and other chemistries for either electric vehicle or stationary storage. Currently about 80% of the world’s lead goes into batteries with a huge amount into car batteries. But now lithium-ion batteries are, in some cases, starting to be used to replace lead-acids in conventional cars. So even in an area they have dominated for a century they are under threat. As the world’s second largest producer of lead, this has interesting implications for Australia. I guess we’re just lucky that we’re the world’s largest producer of lithium. My english is not good enough to understand if the Powerwall is 3-Phase ? 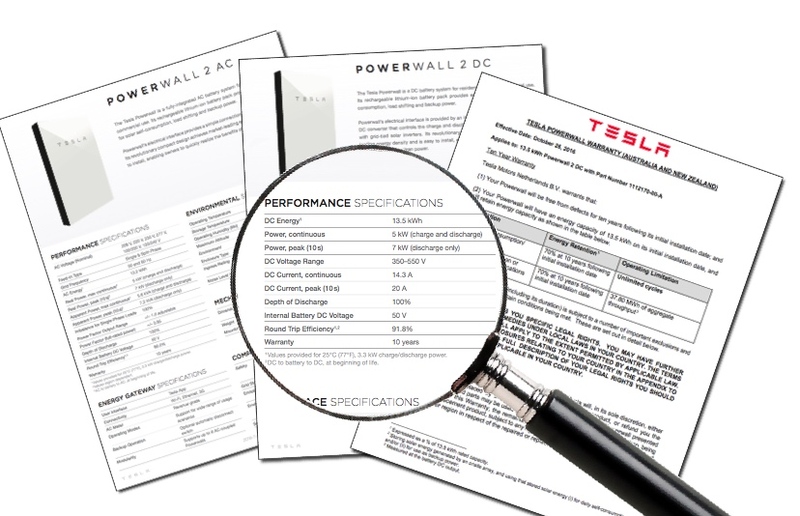 Tesla has not said the Powerwall is 3 phase. I think it will only be single phase. 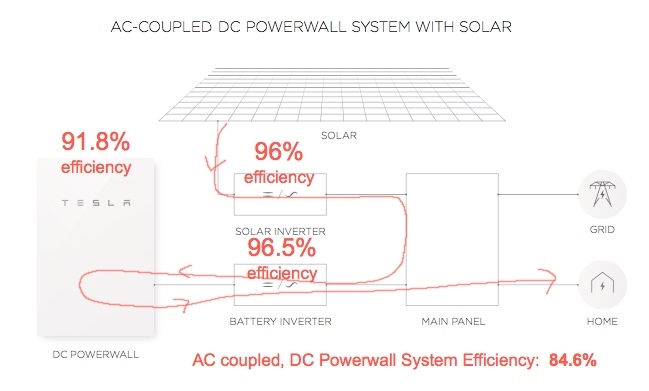 So, can the Power wall 2 be used in 3 Phase Solar Power system? Can Power wall 2 be used as UPS? Hello Ilian. I’m afraid we’ll have to wait until Tesla either releases more information or they start being installed to know just what the Powerwall 2 is capable of. But I am sure it will be compatible with homes with 3 phase solar inverters. Whether or not it can be used as a UPS is not known at the moment. We will probably have to wait until the Powerwall 2 starts being installed before we get all the details on them. In Australia at least, I am pretty confident the Powerwall 2 will work just fine for homes with single phase or three phase power. Hi Theo, MY understanding is that thete are two versions of the Powerwall 2 battery, one with an inverter and one without. In your case if the requirement is to have a battery system capable of supplying all three phases, you have two choices, install three batteries with inveter or use something like a victron inverter charger. I would add that i have no connection with Victron, just my research indicates that the Victron units have some nice features…ie capable of integrating solar, battery, UPS capabilities and a generator for longer outages. As Ronald says there is little information available in the public domain about the Poewerwall 2, sadly we will just have to wait… my evaluation is that it will be worth the wait. Hope this not add to your confusion…. Just checking the wording of the Warrantee and it states “37.80MWh of aggregate throughput”. If this aggregate throughput refers to both the charging and discharging energy then this equates to only 1600 full cycles and the battery suddenly doesn’t look quite as good. The total should be 37.8 MWh of storage. Firstly, if it isn’t that would be a dirty rotten trick. Secondly, the 37.8 MWh is around the maximum amount of storage it would be possible to use, under ideal conditions, using solar self consumption only condition of the warranty. The calculation of lifetime with warranty seems wrong for me. The warranty is 37.500 MWh throughput not energy stored! This means at 13,5 kWh only 1400 cycles and 3.8 years. Hi Jens. 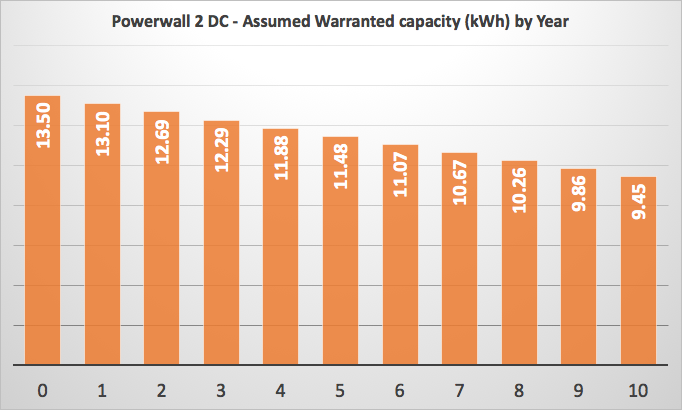 The second condition for the Powerwall 2 warranty, the one that is any use other than “solar self-consumption/backup only”, is for 37.8 MWh of aggregate throughput measured at the battery DC output. So it would be 37,800 kilowatt-hours of stored DC energy from the battery. I got 1600 cycles rather than 1400 because the battery gets smaller as it ages therefore the later cycles are less Wh each. But as Ronald says (and I now agree) “thoughput” shouldn’t count both charge and discharge, the energy put through the battery should only be one of these and the note states it is measured as DC output. just a few questions I have three phase in rural WA looking at Fronius Symo Hybrid 5.0-3-S which has max 8kw input. As inverters can be oversized by 30% does this 8kw include this or is it 8kw + 30% (10.4kw). As the Fronius Symo Hybrid 5.0-3-S is a 3 phase inverter I assume it distributes the power evenly across all 3 phases but if a battery is added does this inverter still distribute the power evenly or would the battery be connected to just 1 of your phases or all 3 phases? If different batteries get connected to 1 or 3 phase which ones can be connected to all 3 phases at once? If batteries can only be connected to one phase would I be better off with one larger battery or three smaller batteries connected to 1 phase each (assuming this is possible both physically and financially? Hi Russ. The Fronius Symo Hybrid 5.0-3-S’s maximum AC output is 5 kilowatts, so it will be regarded as a 5 kilowatt inverter. This means the panel capacity can be one third larger and still receive the STCs that lower the cost of solar, so it can have a maximum of 6.66 kilowatts of panels. If you want more panels and still get STCs I’m afraid you will need a larger inverter. But in rural WA you will probably need special permission or an export limiting inverter or export limiting equipment to get an inverter that is larger than 5 kilowatts. Batteries can AC coupled or DC coupled. AC coupled batteries can be connected to all three phases or just one or two. But with your Fronius Symo Hybrid, your batteries will be DC coupled, so you won’t have to worry about which phase your batteries will be connected to. Electricity from them will be supplied to whichever phases need it. Thanks for sharing. You don’t see too much good stuff on the Powerwall today. But you may have to wait a long time to get a Powerwall 2 as the DC version has been cancelled and the AC version appears to have been delayed. I don’t know where you are, but typically in Australia people can expect to get an average of around 4 kilowatt-hours a day for each kilowatt of north facing solar panels they have. More in central and north Australia and less in Melbourne or Tasmania. So you would probably only generate around 488 kilowatt-hours a month from 4 kilowatts of solar panels, not 730. As you can see, the results are generally fairly similar, with newer installations normally performing a little better than older ones. Thanks Heaps Ronald, all that info was gold to me, thanks for the unbiased advice, I can now make a much more informed decision, I’m in Port Stephens NSW so sunshine is in abundance. I think I’ll forgo the Battery storage for now, even though it would be great in blackouts, but will install a 6kWh solar system, battery ready. Great to have a forum where us novices can be educated so we can make environmentally sound decisions. Hi Ronald, One more question, what is the current opinion on Microinverters,( Enphase S230 Microinverters on 24 Jinko JKM270PP Panels) V’s Power optimisers, (SolarEdge P300 with SE5000 Inverter on 23 REC TwinPeak 280W Panels) best electricity production and reliability/Safety, any change of opinion from the June 2015 article by Finn? I showed an interest in the power Wall but his first concern was for my 1.1/4 HP water pump! Went as far as talking about installing a soft starter. Apparently for our area the powerwall is to lower demand at peak times. To use it as a backup would required a second essentials DB to be installed, which could nullify the above? I have not found any information yet on the power walls transfer ability/ ratings. I have used in the past a Victron multiplus (with the ESS assistant)for both the above 24/3000/50-70 (50amp) transfer contacts paralleled to a grid tied PV. Maybe this will help. The LG RESU 10 I am testing Offgrid can supply 5KW and a 7KW peak for 3 seconds. If your loads are more than these key specs, and the inverter can support the load, the internal LG circuit breaker will trip and there is also a fuse that will blow under more severe loads. Even if you double the capacity, the battery will still be limited by this spec. I think the Tesla will be the same or similar. 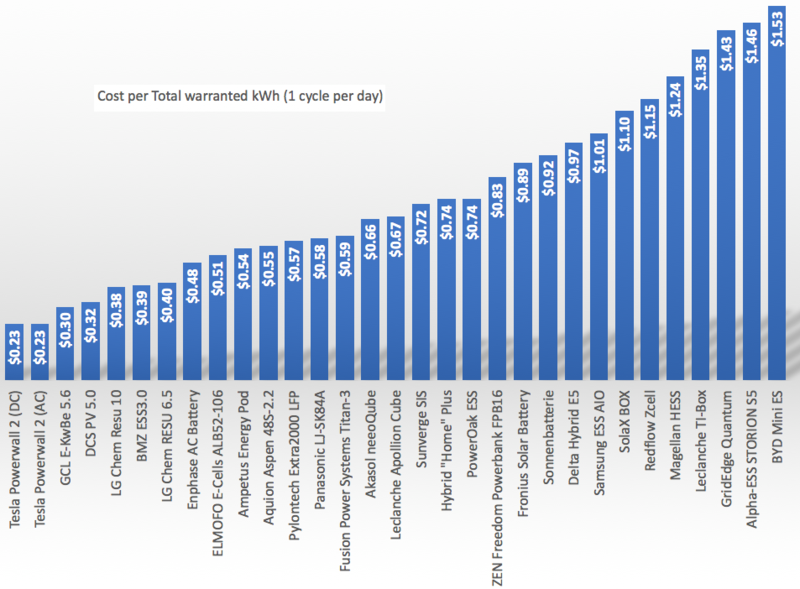 It is hard to beat lead acid batteries at large load support and Li-Ion is not there yet as this shows. The LG is very nice, is available, and well made. The limitations seem to be in the electronics/inverter side of the LG system. I have worked on electric and hybrid cars for one of the largest car manufacturers and the reason that everyone has moved to Lithium technology is that these batteries run circles around lead acid when it comes to large load support. Depending on the chemistry Lithium Ion can repeatedly sustain a 15C discharge for 60 seconds without any effect on its lifecycle. Try that with a lead acid and you can see the effect on capacity instantly. HI FINN ARE TESLA POWERWALL 2 WORTH INSTALLING. I HAVE A THREE PHRASE 5000TL INVERTER ANY POWER THATS STORED WOULD IT SPREAD EVENLY TO ALL THREE PHRASES. HI JOHN, RONALD HERE! Only the AC version of the Powerwall 2 will be available in Australia and all the information I have at the moment indicates it can only be connected to a single phase. This means it will only be able to supply power to loads on that phase and will only be able to be charged from that phase. I can tell you that the Powerwall 2 and batteries in general are not economically worthwhile yet, but if you want batteries for non-economic reasons that’s another matter. I thought that after your article about the surge in the electricity prices across the country the economics of Powerwall 2 will change. Is this still not the case? The bad news is electricity prices are about to rise, but the good news is solar feed-in tariffs are also going to rise. This tends to cancel out the improvement in the economics of battery storage that would otherwise result. I will get an article up on this soonish. I do love Tesla and what Elon Musk does but lately they have been throwing out a lot of diamond dust to keep the hype up. His unlimited cycles is just a theoretical one because nobody will ever use more than 2 full cycles a day on a PW2. 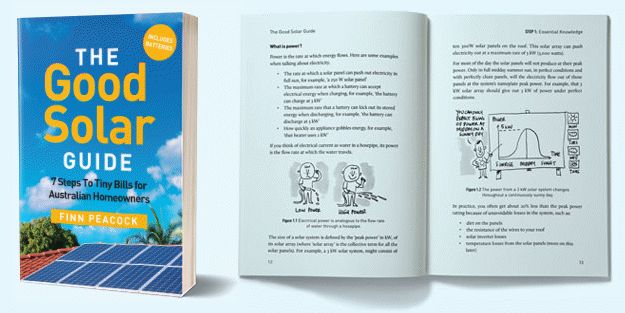 The reason is very simple, to fill the power pack twice a day, you would need to be feeding around 27KWh into the grid every day – anyone with a little knowledge about solar systems would realise that this would mean that your system is hugely oversized which is not really the case for the average system owner. As a point of reference, I have a 5KW system and I put an average 7.5KWh into the grid every day (5 in the winter, 10 in the summer), so to fill the PW2 twice I would need to add another 5KW valued at roughly $7500-$9000, plus the cost of the PW2 brings the investment to an additional $20,000 – unless you are a solar panel junkie, this investment makes no sense at all. The same goes for his lifetime warranty of the solar tiles: the tiles might actually last a lifetime but will the wooden structure last as long? and when the production of the tiles falls below an acceptable level, e.g. after 30 years, what will you do? replace the tiles? is that covered by this “generous” warranty? does the replacement of the tiles or addition of solar panels still make the solar tiles a cheaper option than classic tiles with a roof-top solar panel system? My location is country NSW. My aim is to install a standalone system front scratch and i prefer to go Tesla if i can. I am a creature of night so most consumption will be at night. Two adults live in house. I don’t care about cost. How many Powerwall 2 and panels do i need ? But I presume the property currently has grid power so if you want Powerwalls you can just get one or more AC Powerwall 2s with backup capability and stay on-grid while still having the ability to function off-grid during blackouts. You’ve said you don’t care about the cost, so I’m going to assume you’re rich. If anyone else is reading this, my advice is for rich people only. First, get yourself a huge solar system. Over 9 kilowatts. For cost effectiveness, get the panel capacity as close to 133% the size of the inverter as you can. This is so your rooftop solar system will still produce a reasonable amount of electricity even under poor weather conditions. Nine kilowatts is normally over 30 panels. Since you are in the country you can mount panels on the ground if there isn’t room on your roof. Two Powerwall 2s or equivalent should be more than sufficient for two people. That would let you run air conditioning all through the night, either heating or cooling, as well as provide most other normal electricity use. Of course, if your family is a huge user of electricity you can get three or more. A generator will allow you to get through long periods of bad weather without problem if you are off-grid and if you are on-grid will provide insurance you won’t run out of power during a prolonged blackout. It won’t need to be large, but it will need to be reliable. Finally, no matter what battery system you get, if you are currently on-grid, I suggest staying on-grid. The surplus electricity your large solar system will supply to the grid can more than pay for the daily supply charges for grid power, especially now that feed-in tariffs are going up. This is the case even if you are export limited to 5 kilowatts, as is common in rural NSW. It’s also a much better option for the environment because you’ll be supplying clean solar electricity to the grid for other people to use. Going off the utility (disconnect permanent) leaves one with a home that is harder to insure, very hard to get a loan for, and much lower value if sold. I really have loved being offgrid for 25 years and it is pretty easy if done right so please do not get me wrong. It does require a captain on board! I see this a lot, but if you want valuable advice on solar systems you need someone who takes the time to look at your current usage before recommending ‘getting your self a huge system’. Depending on the size of your home, power demand for a a two person household can range from 15 kWh per day to over 50 kWh per day. A 9 kW system will struggle to cover your needs through May-Sep, (which are typically months of higher than average power consumption). Feel free to follow up with any queries. Ross: On Grid Storage Solutions like Powerwall 2, and Off Grid Solutions are worlds apart technically and are most definitely not interchangeable in any shape or form. The foremost standout difference between the two solutions is not just a technical one but a business management one: that of ‘energy system responsibility and liability’ and it is a critical make or break factor for those system designers and installers operating in the Off Grid space. We never hear much about this critical subject in On Grid or On Grid Hybrid discussions because the system designer and installer willingly become the beneficiaries of a free partner (the Grid) who is effectively looking after both the customer and the system designer and installer by guaranteeing continuity of supply to the customer. However, this (free and substantial partnership) does not exist for Off Grid Solutions designers and Installers who must bear full responsibility and liability to design fail-safe systems that guarantee their Off Grid customers continuity of electricity supply 24/7; no excuses. Off Grid system integrators must therefore implement (100%) fail-safe core system design logic above all other considerations at the Off Grid Solution design outset, if they expect their Off Grid business to survive and thrive beyond the first installation. Effective and enduring (24/7) Off Grid Solutions design is a very complex field and that is one reason that we don’t see many engineers and technicians jumping ship from the low responsibility On Grid industry to get involved in Off Grid Solutions; the risks are simply too high for most to contemplate let alone overcome through engineering design. If you would like to learn more about Off Grid Solutions though Ross, please feel free to contact me at any time. Q :- What is the foremost ‘key component’ of a high performance fully featured Off Grid Solution, that would be considered by the design engineer at the commencement of the system design process? ANS :- A purpose designed Off Grid System Remote Monitoring and Control Unit (OGSRMCU) operating independently of the system PV array and inverters, precedes all other ‘key component’ design considerations. The (OGSRMCU) is the system ‘brain’ responsible for controlling every functional aspect of an Off Grid and Off Grid Micro Grid System, and is therefore the most important ‘key component’ of an Off Grid system. It follows that unlike rudimentary On Grid monitoring only systems (no controls) which are embedded in inverters, Off Grid systems require complex and comprehensive interfacing and control capability and must therefore be totally independent of other components including the system DC and AC power supply. It interfaces with a comprehensive array of analog and digital output sensors and transducers, and makes real time decisions to control and optimise the overall system functionality dynamically, including battery charging and discharging, and system load control. Importantly the (OGSRMCU) protects the system at all times and informs and directs end users and system managers via ‘mission critical’ dual redundancy communications sources such as SMS, email and internet, and allows for total system control remotely 24/7 by the system installer/manager. The (OGSRMCU) is intuitive and learns over time creating optimum performance algorithms on the fly from observed trends, and importantly provides the system manager/installer with predictive maintenance and breakdown forecasts based on measurements of key system performance parameters. The (OGSRMCU) system is designed to emulate the traditional customer/Grid relationship by eliminating the need for any end user intervention in the normal functionality and operability of an Off Grid system. One design issue that I often see mishandled by Off Grid Solutions designers is that they struggle sometimes to understand the important role that a Genset can [and should] play in a well-designed Off Grid Solution. Some designers get stuck and go to great lengths to “design out” the Gensets’ role because they consider it as an “emergency Generator” only, and instead opt for an oversized PV array, inverter and battery storage capacity as a consequence. Gensets’ do have a role to play in every Off Grid Solution, albeit a small (in most cases) but nevertheless important one. I always include as standard two Gensets’ in Off Grid system designs; one small capacity specifically for critical/essential services if required; and one for greater than the maximum demand possible for the sum of the distribution system circuits. Once system designers understand the important benefits that “effective and precise” Genset management logic via the (OGSRMCU) controls can bring to the overall system functionality, (particularly in extraordinary times) a new design paradigm is exposed for the designer to exploit. System hardware costs can be reduced, overall functionality can be optimised, and reliability bolstered; importantly battery storage DOD can be strictly enforced by the (OGSRMCU) ensuring an enhanced life expectancy for the large ticket item [batteries] and all this only when required, and for the cost of a very modest volume of gasoline per annum. It sounds like you are connected to the Grid at present but contemplating disconnecting and cancelling that service and moving to an Off Grid generation plant. Great idea. Ronald has made some useful comments Scott, but I don’t share his view about staying On Grid. Off Grid technology is not new, it is a mature (small thru large scale) technology, popular globally from for many years now and powering businesses; massive irrigation and pumping systems; light and heavy industries and factories; and all types of urban and rural community micro-grids. For example I have been involved in commissioning teams overseas of large Off Grid PV inverters (over 1.0 MW capacity each) so the global Off Grid sector is certainly a robust and capable one. Nepal is a good example of the ascendancy of Off Grid solutions, as it generates more than 50% of its total power production via Off Grid and Micro Grid systems and that trend is rising. Whilst Australia has been quick out of the blocks in On Grid PV Systems uptake, the Off Grid PV and Battery Storage sector development has been largely ignored, with the exception of some small scale water pumping and irrigation solutions. One reason for this anomaly is that overly generous Government rebates, subsidies and feed in tariffs for PV systems, polarised the Australian energy engineering sector since 2007 which in turn discouraged local investment and R&D in Off Grid and Micro Grid technologies. All of the spoils went the way of the On Grid sector. That situation has been arrested with the boom in energy storage technologies such as batteries, but is not restricted only to batteries. Small scale PV Off Grid Solutions are very well suited to CAS (Compressed Air Storage) technology rather than batteries, with the loss of efficiency of CAS being more than adequately compensated for by reliability and the low maintenance long life metrics of CAS coming into play. So in summary there are now very persuasive economic and technical arguments supporting a move from Grid supply to Off Grid entirely. The devil is always in the detail though, and I encourage you to continue investigating and learning about the technology; what are the best system design principles to consider; and how suppliers and installers are able to best support their customers systems over 25 years or more, to help you move your project forward with confidence. Always remain circumspect though Scott because what is definitely not appropriate is for an Off Grid customer or group of customers becoming energy starved captives to a marginal Off Grid or Micro Grid system design, that lacks proven long term functionality and reliability, and also fails to service the load requirements without any fuss 24/7, no excuses. Getting back to your original question though about the Tesla Powerwall 2 system: no it is not at all useful in an Off Grid solution for a plethora of reasons that I won’t bore you with in this post. Hi guys, thanks so much for your blogs and site, which helped me greatly with quotes in April 2014 when I chose one of them and installed a 3 kw system of 12 panels with a Growatt inverter for $3,000. I work from home much of the time so am using a lot of the power generated by my system. We are in a rating 6 (insulation efficiency) fairly new townhouse and there are two of us, but my partner works outside the home Monday-Friday. I calculate I’ve been saving $800 p.a. on my bills over what I was paying, even though the panels face west rather than north, so expect the system to have paid for itself in about 4 years and am very happy with that, though the savings are probably more due to price rises the last couple of years. From what I read of the Powerwall 2 on this and other blogs, it is really only ever going to be worthwhile if we generate far more power than we do, or the batteries reduce drastically in cost. This is a little frustrating for me, because when my system has paid for itself less than a year from now I would love to get a battery and save even more, and possibly even get it to near-nil cost. Can you see how I could do this? I’d be happy to put up more panels but we are limited to 5 kw (kwh?) installation here in Victoria, meaning a maximum of another 8 panels, and I assume a 5 kwh inverter. How cheap would batteries have to get before this was economically viable? I wouldn’t even mind if it was marginal, for the satisfaction of paying little or nothing to the rapacious power companies, and the satisfaction of knowing in the evening that I’m using power from my own source and not paying them for it. Any thoughts you have would be appreciated. High Ted. I’m afraid you’ll probably have to wait a few years for batteries to break even. Actually, with the higher feed-in tariffs that are available now stay high, it may be more than a few years. But getting your solar panels up to 5 kilowatts can provide a positive return. (With 5 kilowatts of panels the total capacity of your inverter or inverters will need to be 3.75 kilowatts or more.) One thing you could do to reduce the amount you pay to rapacious power companies is look into energy efficiency measures you can take and some people who are unable to install as much PV as they want install a solar thermal hot water system. I am buying a 7 ac property zoned rural near Mandurah, WA. Mains power is available to the front of the property. I will need to run mains power approx 360m to the house site. My power usage over the past 12 months has varied from 10 – 22kwh/day with an average around 17.5. I expect power consumption to increase 10-20% in the future, mainly through the day. I am home during the day, my wife is not. I am considering two alternatives. Mains Power – Install mains at a cost of $20,000-25,000 and perhaps 5kw solar system with no battery. Fully offgrid – Install 10kw solar system with two powerwall 2’s and a small backup generator. Cost roughly $30,000. How reliable would the offgrid system above be. We can cut power use down for a few days if necessary. Being off-grid in WA will currently save you around $2,000 a year if your home had no rooftop solar. But with a 5 kilowatt solar system and a 25% self consumption rate you would save around $1,100 a year. And since I’d suggest getting a 6.5 kilowatt system you’d only save around $900 a year with that. If we assume getting connected to the grid will cost $22,500 and going off grid will cost $25,000 more than getting a 6.5 kilowatt solar system, and the batteries and generator will last 10 years, and the cost of grid electricity remains constant in today’s money — then if you connect to the grid, after 10 years you will have spent a total of around $31,500 on getting connected to the grid and grid electricity. If you go off-grid then you’ll only have spent $25,000. You will need replacement batteries at this point, but hopefully they will be much cheaper by then. Batteries may not last for 10 years. It ignores the fact that being off-grid is not as convenient as being on-grid. It ignores the cost of generator fuel and generators may not last 10 years. It may cost considerably more to go off-grid. I have not heard of Powerwall 2s being used off-grid, so I’m afraid I have no idea how well they would function. I’d actually be surprised if they are being used that way. Also, I think it would be unlikely you could get a large solar system, two Powerwall 2s, a generator, and off-grid capability for only $30,000. But I have been pleasantly surprised by declining prices in the past. If you are willing to accept that being off-grid is not as convenient as being on, and the total cost of your off-grid system is low enough, and it ends up being reliable enough, you may come out ahead. Whether or not it is worth the risk is something I can’t say. I forgot to add that I will be able to design the electrical system of the house from scratch. Will have to change from induction cooktop (which I love) to gas as well. Gas instantaneous HWS as well. Mark having the advantage of designing an off grid solution for your premises from scratch rather than a retrofit is a distinct advantage in your favour. 1. Modern Rural Off Grid solutions are not toys for users to experiment or play with as has been a feature of many past Off Grid installations. They must be commercially focussed, self-reliant generation plants with inherent ‘smarts’ that as a minimum level of functionality emulate the grid performance; no ifs – no buts. It follows therefore that a modern Off Grid solution provides a guaranteed permanent autonomy for critical essential services circuits as a minimum under any and all circumstances. This is a very important point that should not be overlooked. Having control of your circuits design at the outset makes this a far simpler consideration for the system designer to plan for also. 2. Total Off Grid solutions particularly in rural applications must provide for solar water pumping solutions as well as general power functionality. This is easily and cost effectively managed by using Variable Frequency Drives for one or more water motor/pumps circuits connected to the solar PV Array DC bus (via smart control logic). Modern water pumping solutions are critical in Off Grid designs and in particular solar (thermal) hot water solutions which are very efficient. PS: Off Grid premises should never contemplate heating water by electricity. 3. DC Coupled Off Grid solutions are far more efficient than AC coupled systems. DC Coupling is not simply an equal alternative to AC coupled design, it delivers an entirely different level of system stability; reliability; endurability, and functionality not achievable in AC coupled systems. Foremost is extended battery storage life through controlled DOD and SOC ‘smart logic controls’. And most importantly design simplicity and efficiency through a higher DC Voltage Bus (typically 450 – 600 VDC). Higher voltage lower current systems offer many options and advantages to the life and functionality of DC power conversion systems and components, and in particular storage batteries. 4. Remote system monitoring and bi-synchronous control communications. Critical services communications from a system designer’s perspective is elevated to important point 1. It must be autonomous and not rely at all on any user services such as Wifi, and as a minimum have dual redundancy functionality including SMS and Web capabilities. Importantly it must be fully featured providing both monitoring plus full system control functionality. These are just a few important points that you should discuss in detail with your systems designer Mark, and all the best with your project, it is an exciting time for you. So, that will make a difference, not ? When someone is talking about how many cycles a battery is capable of it is important to be sure they are talking about full cycles where the battery is completely discharged or to a specified depth of discharge. Otherwise they could potentially claim 10 minutes use is a cycle. Fortunately, I haven’t noticed battery salespeople doing this but it is still something to watch out for. A more common trick is to say a battery is capable of a huge number of cycles but only provide a warranty for a much lower number of cycles. These days the whole cycle issue is often avoided by instead stating how many kilowatt-hours of stored energy supplied warranties cover. If you have a 12 kilowatt solar system and are normally sending loads of solar electricity into the grid you should have no trouble keeping a Powerwall 2 charged under normal circumstances. But note you may need a generator anyway the times when you lose power are likely to be times when solar output is very low. If you are in for a hurricane the skies may be cloudy for days before hand and they may be cloudy days after. So your Powerwall 2 could be low when you lose power and while it can charge from your solar panels during the day your solar output may low afterwards. Looking at the Tesla site I see no indication that the Powerwall 2 can be forced charged when a hurricane is coming so it will be full if you lose power. I hope they will have a better system in place than calling up Tesla and asking them to do it remotely. Note the Powerwall 2 can only provide 5 kilowatts of power. That’s plenty for someone like me to get through a blackout, but it’s less than one-third what a 16 kilowatt generator can put out. At the moment the Powerwall 2 can’t be charged from a generator. This is unfortunate, otherwise you could just get a very small one and run it to top up the Powerwall. But you could get a small, low cost generator, it wouldn’t even need to be wired in, and run some loads off that to conserve Powerwall 2 charge when skies are cloudy. So if you want to live through blackouts without inconvenience you could either install a large generator or multiple Powerwalls. Or you could get one Powerwall 2 and be careful with your electricity use and possibly use a small generator as well. It basically comes down to how much money you have and how you want to spend it. Having a Powerwall 2 can save you money on your electricity bills, but I don’t know how much that will be in Florida, so that is a consideration. But it won’t pay for itself. They don’t that here in Australia yet where our electricity prices are sky high. We’ve recently installed a 10.8 kW system with Fronius Symo 10.0-3M-L three phase inverter @ smart meter. After the first hundred days we’re exporting an average 19kW per day – although currently less as we hit Winter in Adelaide. Our energy retailer has an offer on discounted Powerwall 2 as part of an agreement to become part of a Virtual Power Plant for 5 years (simplyenergy.com.au/smart-storage) which looks a reasonable opportunity. I understand that Powerwall 2 AC coupled will be compatible with our Fronuis inverter, but from reading the thread above the Powerwall 2 cannot accommodate 3 phase power – or does the battery feed back to the inverter that then distributes across the different phases? The Powerwall 2 can be installed in a home with 3 phase power but it will only be connected to one phase and so can only power appliances on that phase. You will probably need some rewiring of your switchboard to ensure that loads that you want to work during a blackout are connected to that phase. The Powerwall 2 is completely independent from the inverter. This allows it to be installed no matter what inverter you have, but it can’t work as a team with an inverter to supply power to all phases. Just wondering why the Enersys HuP Solar One battery wasn’t included in this comparison analysis? I’ve had one for over 14 years a 24-volt system rated at 860 amp hours Peak and 80% depth of discharge. Still going but down below 60% of is rating its time to replace. Also rated unlimited/3200+ cycles with a 10 yr warranted. Super helpful write-up, thank you so much! Question, is Tesla incorporating parasitic load (eg. cooling) into their round-trip efficiency numbers? Seems to me that they *may* be using an ideal temperature assumption which may not match real world conditions. I would expect the actual Powerwall 2 round trip efficiency to be considerably less than Tesla’s figures. Unfortunately, Tesla has made it difficult to determine what it is, but before they made that change I’d heard numbers well below Tesla’s. The fact they don’t want you to know is not a good sign in my opinion. Finn is likely to test his Powerwall 2 at some point and it will be interesting to see his result.